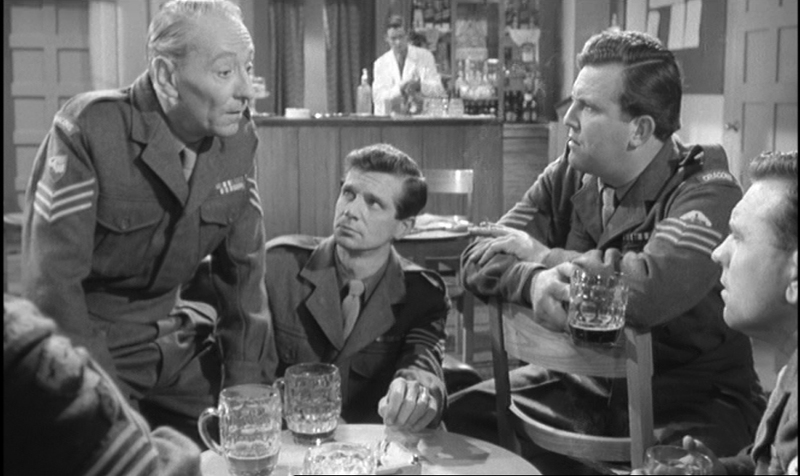 Before there was Barbara Windsor and Sid James, before there were non-stop double entendre there was this film about conscription and an old sergeant who was about to retire. I doubt anyone at the time really expected this film to be the starting point to a long list of 31 films and even a TV series. This film is a black & white production from 1958 that was adapted from a play written by R F Delderfield called The Bull Boys. This is Carry On Sergeant. Like a lot of things, I came late to the whole Carry On franchise. I remember one Friday night, I was at home and turned on TCM (Turner Classic Movies) and saw that Carry On Sergeant was on TV; I had never seen it before. What I like about TCM is that each film is introduced by a host to give everything a little bit of context. This night it was Robert Osborne who has been hosting films there for years. It was a double feature that night of Carry On films. It was followed up by my personal favourite, Carry On Nurse, though I didn’t know it was my favourite yet. Anyway, Robert said that this was the first time they showed any Carry On film. I was floored! It must have been 2010 or something. How has it been that these films had been around so long and they have never been shown on TCM? That was surprising to me. I was glad to start watching these as soon as TCM started to show them. I really enjoyed watching those films that night. Jump forward to the end of 2014. 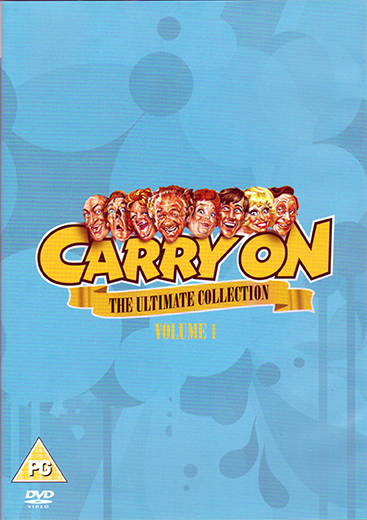 After thinking about it for a while, I finally bought the UK box set of Carry On films. It was kind of daunting which set to get or do I pick up the few films that have been released on Blu-ray, finally I choose the overall boxset for the films. Between Christmas and New Years, the company I work for is closed over that period. So, I sat at home and binged on all of the Carry On films over a 12 day period. It was amazing. Related in an unrelated way, I was so enamoured at that point to make my own Bloody Mary mix. So, I did that multiple times while watching these films. 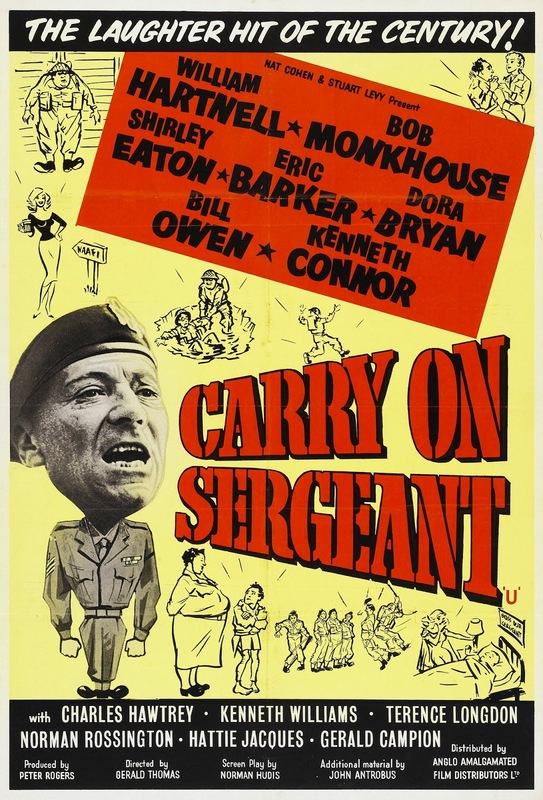 I watched all of these films and of course, I started with Carry On Sergeant. Ok, let’s get this out of the way. The film stars William Hartnell. Doctor Who is a big part of my life and I love it so this is obviously very interesting for me. Hartnell played the original Doctor. Oh, and he played it brilliantly. This film is probably around the time where Hartnell was getting frustrated with the type of parts he was being offered. They were always tough guy army roles. I would think that this falls into that category but I think this is acutely different. 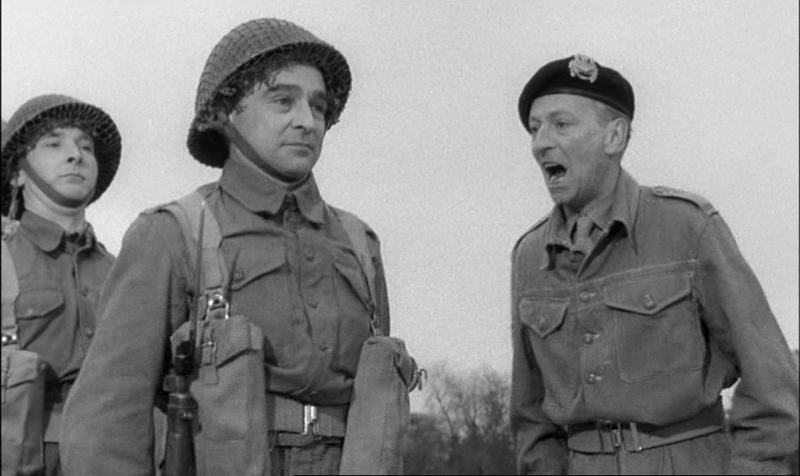 Hartnell would have been on The Army Game by this point playing a Sergeant there too. 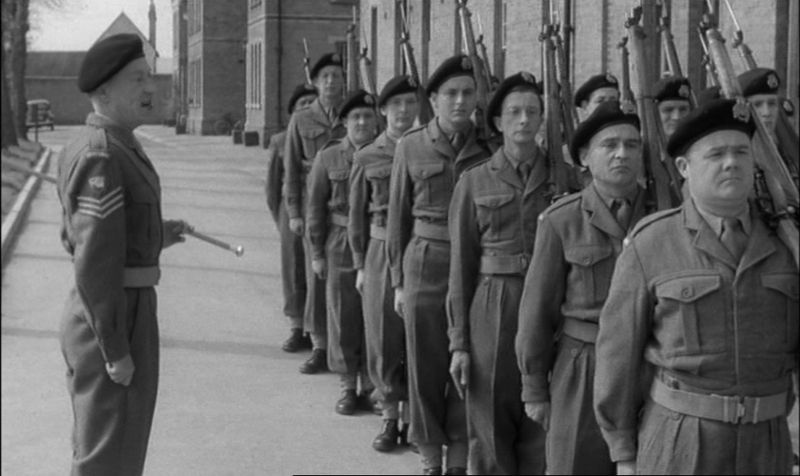 In this film, Hartnell plays Sergeant Grimshaw. The film starts out with Bob Monkhouse, ok his name is Charlie, getting married to Shirley Eaton also known as Mary Sage in the film. Well, at the reception Charlie has found out that he had been called up for duty. Please note that there was not a war going on but it was part of conscription. I talk about conscription here and here. Oddly, Charlie needs to leave that day for duty. I don’t know how conscription works but once you get the letter, do you have to leave that day? Anyway, Charlie is off. What is really sweet about this is that Mary follows him. She stows away on another truck and sneaks into the base. I thought this was going to be the main plot throughout the film. I thought there were going to be zany ways that Charlie would have to sneak out of barracks or some other duties to try and get a chance to be with his wife. One of my favourite scenes in the film is where Mary is adamant that she and Charlie spend their wedding night together. Nora, the canteen manager Mary befriends, has a room ready for them for that night. Late that evening, Mary gets there first and slowly opens the door to go in the room. She enters the room only to find Sergeant Grimshaw sleeping in the bed. She quickly leaves but Charlie shows up next. He knocks on the door only to hear snoring. He knocks louder quietly talking to through the door that he can’t wait to see Mary only for the door to open up with Grimshaw staring at him half asleep on the other side of the door. 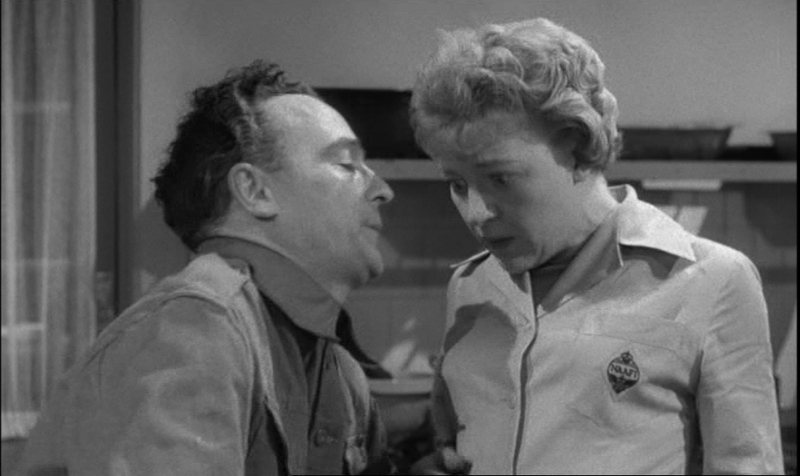 Hartnell does great comedy, it is a really fun scene. My point above is, I am glad the film was not about Charlie sneaking around to be with his wife. This plot point is cleared up very quickly allowing Charlie seven days of leave to spend with his bride and allowing for Mary to stay on during the remainder of Charlie’s training. This is good because it allows us to focus on some of the other characters that are in camp. In fact, what becomes the main thread for the film is that Sergeant Grimshaw is retiring after this platoon finishes training. He has never had a champion platoon during the entire time he has been there. In fact someone talking to him, Sergeant O’Brien, places a wager of £50 that once again Grimshaw’s platoon will not rise to the top. Grimshaw accepts this wager. An interesting note is that Sergeant O’Brien is played by Terry Scott. Terry becomes a semi-regular in the Carry On series about a decade after this film with Carry On…Up the Khyber. I have been watching Terry recently in the Simply DVD release of the 1960s BBC comedy Hugh and I which I have found to be much better than I expected. I loved Hugh Lloyd in his appearances in Hancock’s Half Hour so I enjoyed this quite a bit. Of course to many Terry Scott is also known as the voice of Penfold from Danger Mouse. Much of this film surrounds the men of this platoon learning how to do things in the army and failing. You have people like Peter Golightly played by Charles Hawtry who is horrible at any kind of physical endurance. 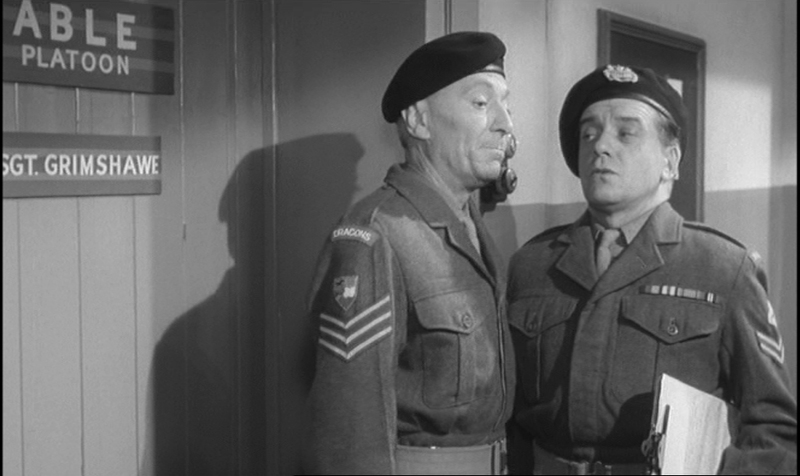 There is the great Kenneth Williams who plays James Bailey who is too much of an intellectual to care too much about anything to do with the army. When Grimshaw took on this platoon, he had high hopes that he could turn these men into a champion team but sees immediately that they are a bunch of imbeciles. 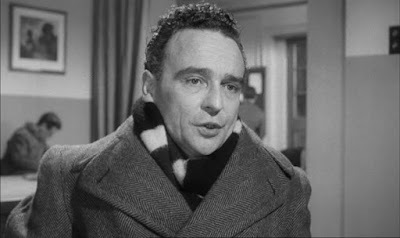 Kenneth Connor plays Horace Strong. Horace is a hypochondriac. He always thinks he is sick. He goes see the nurse every day to see what is wrong with him and every day she tells him he is very healthy. He is completely fine. The nurse is Captain Clark played by the wonderful Hattie Jacques. I adore Hattie in everything I have seen her in. Of course the first time I have “seen” her I had only heard her. She had a regular role in the radio version of Hancock’s Half Hour as Ms. Pugh, Hancock’s long-suffering secretary but also played a lot of other voice roles on the show. She had a tremendous voice with lots of range. Kenneth Connor appeared years later as Monsieur Alfonse in ‘Allo! ‘Allo! Oh, his ticky-ticker! I really enjoyed the sub-plot of Nora, the canteen manager, who has an immediate crush on Horace. She chases him all over the place but he’s too shy (and he thinks too sick). I think this is an interesting point to bring up. There are people who are in this film that I only knew from later work but in this film these people are in the height of their lives. I will be honest but I have rarely seen anything with Bob Monkhouse in it. I do not live in the UK so anything I would have seen of him would be fleeting. I have seen him in an episode of Jonathan Creek. Since the subject of missing British television is such of passion of mine, I know his name mostly as someone who loved the new burgeoning home media recording movement during the 1960s and 1970s. We have a lot to thank him for because of his diligence in recording programs in the audio and visual mediums. When I would see Monkhouse, he was an old man. When I saw Kenneth Connor on ‘Allo! ‘Allo!, he was an old man. The first time I saw Bill Owen was in The Last of the Summer Wine which was an older role for him. I had only seen William Hartnell play an old man. This is what makes the film fun to watch. These men are all young or at least younger. They show off how fit they are. Hartnell looks physically solid in the role. 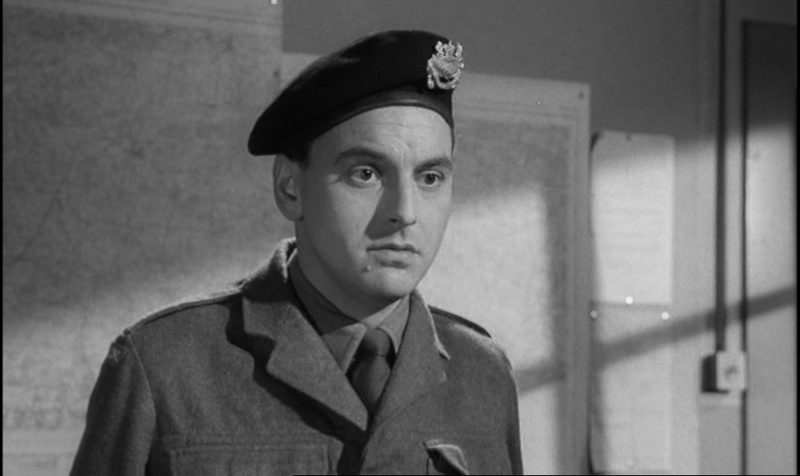 Check out Kenneth Connor at the end of the film and some of the stuff he can physically do shows off his strength. Bob Monkhouse is young. This is really fun to see. It’s an interesting perspective than some of the others because being in the US, we only get glimpses of actors from the UK based on how popular a series is to be exported over here. A lot of times, these actors are older in those series. It’s even nice to see Bernard Kay have a small role in this film. What is unusual for a film is that there is no conflict in this film. What I mean by that is that no one is trying to mess anyone up. There isn’t an adversary. All these people are going about their business not trying to mess up anyone else. I think it is summed up nicely by the time we get to the end of the film. The night before the final parade, they find out by listening in on a conversation between Grimshaw and Corporal Copping about the wager that Grimshaw made. When the guys are sitting around the table talking about it, Andy Galloway mentions that Sergeant deserves to not win the bet because he has been in their business so much and really hard of them. Someone asks Galloway to explain when had Grimshaw been in their business and no one could think of anything. In fact, Grimshaw has been really decent to them the whole time. That’s when they decide that they have to try harder than they ever had before to try to win it for Sergeant Grimshaw. They all rally behind him. Grimshaw has no idea any of this is going on at this point. This film is a bit feel good with a happy ending. As one can imagine, the platoon pulls off their exercises flawlessly. They win big for Grimshaw who can now retire as a happy man and fifty quid richer. In a very moving scene at the end of the film, the platoon gives Grimshaw an engraved lighter and Corporal Copping gets promoted to Sergeant. This borderlines on an almost sappy ending to the film. I like it but it’s a touch saccharine. The funny thing is that Grimshaw was being extra careful to not bully the men as he usually would. He knew this was his final group and seeing how little success he had with winning the championship in the past with shouting orders at everyone, he decided on a different approach. The role that Hartnell plays as Grimshaw is very different to the role he plays as Sergeant Major Bullimore in The Army Game. I think it is fair to say a lot of the way that Bullimore acts could be out of desperation of the men he had in his platoon. Though there is also by nature that he just liked to bully and watch his men get their comeuppance. Grimshaw is probably just a tired person by this point. Even Nora and Horace finally fall in love. After Horace is taken to a team of experts by Captain Clark to prove there is nothing wrong with him, he realizes he has something good with Nora. The plot for this film, to me, is tighter than a lot of the Carry On films. I think it is interesting because I feel a lot of the other films are more set pieces with strong comedy of varying degrees. This is more plot driven but the laughs are a different kind of comedy. It’s not sexual. It’s a straight forward. There are not a ton of laugh out loud moments for but a lot of little pieces that made me smile and chuckle. In 1958, this film was the third highest grossing film in the UK that year. 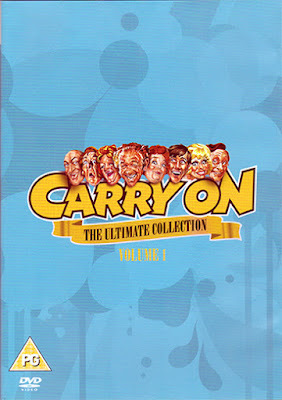 Ultimately, it allowed this Carry On franchise to, err, carry on! If you are a fan of these Carry On films, I would highly recommend Carry On Confidential by Andy Davidson and published by Miwk Publishing. It can be got here. It’s well-researched and fun. Next week: I get to look at one of my new favourite series even though it is quite old. I never watched the Joan Hickson Miss Marple when it is was A&E. Over a year ago, I bought the UK DVD set which almost a week later it was announced the series was coming out on Blu-ray. Anyway, I focus on an earlier story, The Moving Finger and I explain why I love this series so much. Next review: Sometimes when you ask for George Gently Series 7 Blu-ray, life gives you Vera set 5. Now, that we got that all figured out I finally have George Gently Series 7 on Blu-ray and I look forward to reviewing it very soon.